In 2008, April Bleakney (Ape) graduated from Kent State University with a BFA in Fine Arts, printmaking. While working with a non-profit youth program as an AmeriCorps VISTA, she also began a recent grad residency at Zygote Press. While there, Ape printed a few tees for herself. The infamous ‘YEAH I’M FROM OHIO’ design was born at this time – a photo of the tee was posted online and requests for this shirt started coming in. This was the seed leading to APE MADE’s founding in 2011. APE MADE’s focus is promoting themes of local pride with simple, original, and fun designs on quality handmade goods, with an emphasis on hand drawn design work. 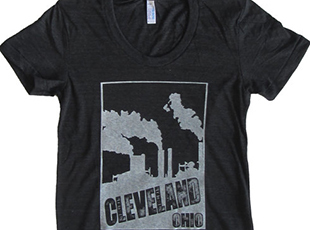 All artwork, design, screen printing, and packaging is done BY HAND by hand in Cleveland, Ohio – using eco-friendly, water-based textile inks and no machines or harsh chemicals.